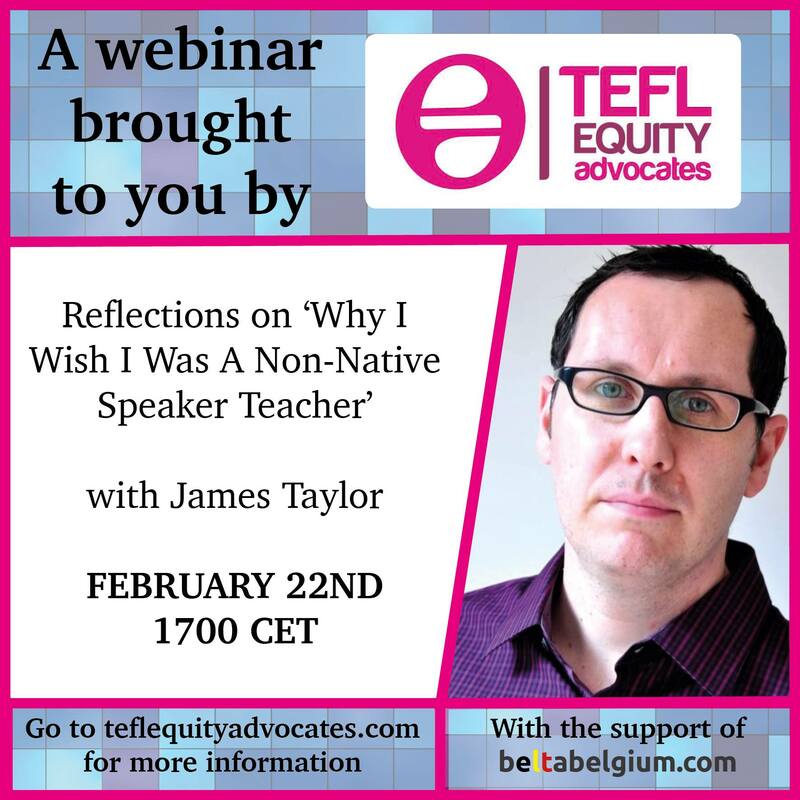 In this post I’d like to give you a summary of the first TEFL Equity Advocates webinar: ‘Reflections on “Why I wish I was a non-Native English Speaker”’, which was given on February 22nd by James Taylor, the president of BELTA (the Belgian English Teachers Association), which supports the project. You can watch the complete recording of the webinar below. You can read more about the upcoming webinars here. Vicky and Adi pointed out that the concept of a NS can often be linked to race and certain physical features, i.e. an Asian-looking US citizen might not necessarily be regarded as a NS because of their looks. Elena (Russia) and Evelin (Hungary) said that although their students are very satisfied with their classes, they are still paid less than equally or less qualified NS at their schools. However, Marjorie highlighted that there was no difference in pay between NESTs and NNESTs in Austria, except for freelance situations. Karin agreed this was also the situation in Israel. Others mentioned that in Greece, Brasil, Argentina or Germany being a NS gives you better job prospects. On the other hand, Chuck thinks that NNEST situation in Japan has improved a lot and that increasingly qualifications and experience are becoming more important for recruiters. Finally, several people raised the issue that in many countries it is difficult for NESTs to get a job in the public sector, because they do not have the locally recognised teaching degree. What is a Native Speaker nowadays? What does it mean to you? Is it a useful term? Vicky, Evelin, Joris and Marijana think a NS is someone born and raised in an English-speaking country, however, Chuck jokingly points out that he’s ceased to be a NS a long time ago and asks whether after 20 years of living abroad you can still be one. Elena, who works in Russia, mostly associates the term with a US or UK citizen. Vicky believes, however, that the issue is much more complex – although she lived most of her life in Greece, most people still consider her a NS because she has the Canadian passport and was born there. Helen points out, though, that having being born and raised in an English-speaking country doesn’t mean one can speak the language perfectly in all situations and registers, which is often how a NS is marketed. David thinks that setting the NS as a language goal for our student is unrealistic. Thiaggo believes that the term is doing a disservice to our field. Several people agree with him and suggest abandoning the term all together in favour of a more inclusive one. Shouldn’t we be ignoring the whole idea of NNESTs and NESTs and talk about good teachers instead? Many participants give examples indicating that both NESTs and NNESTs have different strengths and weaknesses, which are often highly dependent on each and every individual. As a result, they suggest that ‘nativeness’ should not be taken into consideration in hiring teachers. While in many parts of the world NNESTs are still perceived as inferior to NESTs, Meike suggests that the ideal situation is that students are taught by both groups. As mentioned above, some participants think that the term native speaker should not appear on job ads, and David suggests that high proficiency in English is used instead, which all candidates (NESTs and NNESTs alike) should be tested on. Finally, Priscila points out that we should be talking about what good teaching means rather than about where the teacher is from. What can we do to improve the situation of NNESTs? As a recruiter, hire the best teachers regardless of where they’re from. As a NS, don’t stay silent when your NNS colleagues are treated unfairly. Talk to your Teaching Association about the issue. Ban job ads that include the term native speaker from your job listings (as TESOL France, MELTA and tefl.net have done). When you are told that a NEST is better than a NNEST, don’t ignore it, but question it. Raise awareness of the problem. If you’ve enjoyed James’ webinar, you can read more about the upcoming ones here. The next one is going to be on: Lexis, Speaking and the Non-Native Speaker Teacher, will take place on May 10th and the speaker will be Hugh Dellar. Don’t miss it!